Thank you, Bull Run Patrons! 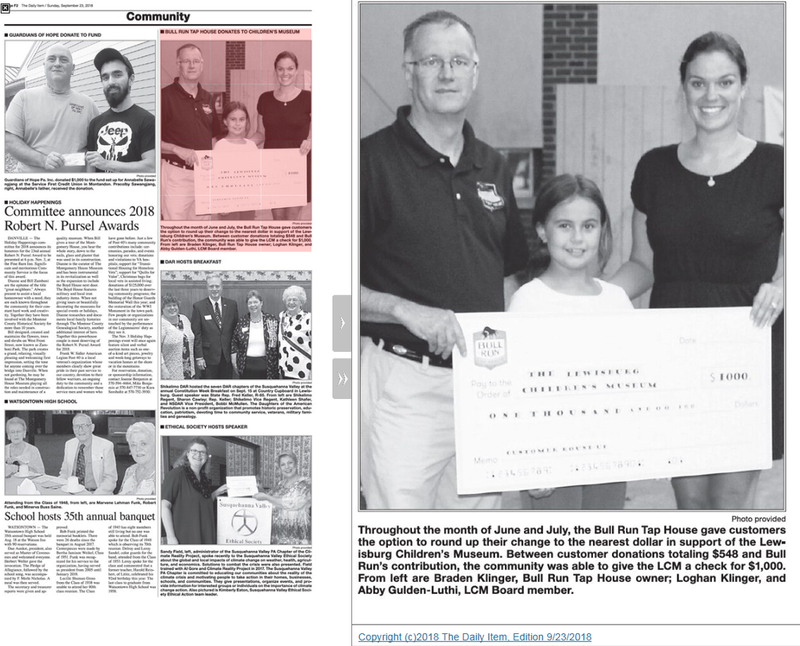 Throughout the month of June and July, the Bull Run Tap House gave customers the option to round up their change to the nearest dollar in support of the Lewisburg Children’s Museum. Between customer donations totaling $548 and Bull Run’s contribution, the community was able to give the LCM a check for $1,000. From left are Braden Klinger, Bull Run Tap House owner; Loghan Klinger, and Abby Gulden-Luthi, LCM Board Member. Pub Crawl registration was a Success! With more than double the registrants they hoped to have, the first Market Street Pub Crawl (happening tomorrow, Fri Aug 11) is sure to be a total Blast! Thank you to our awesome Office Manager, Carey, and to the Downtown Lewisburg Partnership for organizing such a cool event! Read about the Pub Crawl in the Daily Item here. (also - featured in the picture is Bull Run's daytime server, Katelin!!!). Welcome PIAA Swimming and Diving! Read the article by Eric Scicchitano (Feb 28, 2017) on the benefits to local businesses for hosting the collegiate sporting events here in Lewisburg! And thanks, Justin Engle, for including the snapshot of Brooke, our Bar Manager, in the article! The Daily Item - Bull Run Tap House is mentioned! What a fun surprise to open our copy of the Daily Item and see Brooke on the cover! Thank you, Eric Scicchitano and Justin Engle, for including a photo of her behind the bar. We're excited for the upcoming events and look forward to serving new guests! Eric really captured the essence of our "mission" and what we hope to accomplish in the next year at the restaurant (thank you, Eric)! Click Here if you haven't had a chance to read it yet but would like to. The first question I get asked when someone finds out that we bought the Bull Run is, "Will you be making any changes?" YES! We will be making changes...it will happen over time, but you should start to see subtle changes immediately! We will be experimenting with specials for lunch and dinner, and hope to have a full menu change by late March. Be sure to Like our Facebook page so that you stay informed of these specials! We will be bringing in new wines and spirits - move over, beer! There will be phased remodeling, starting with the Tap House side (new bathrooms, cosmetic changes, new dining furniture). Remodeling to the back dining room will include the creation of a private meeting space that will accommodate up to 30 people. By fall 2017 we hope to be serving breakfast in the side dining room, as well as start our catering business. Thank you for your support as we work to incorporate these changes. We hope you'll stop in often to spot the differences!